Planning a wedding can be dizzying, to say the least! 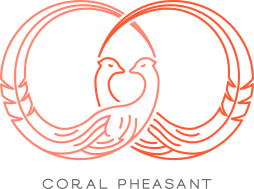 Let Coral Pheasant help you put your own stamp on one of the most personal items on the list – your stationery. We know all the ins and outs, the dates, the timing, the way it works! Once you commit to working with us, we’ll make every effort to maximize the fun and minimize the stress as we guide you through the paper process. Of course, you may have some burning questions at this very moment. Keep reading and perhaps we can get them answered for you! CAN I ORDER MY INVITATIONS ONLINE? To make your invitations really speak your language, we want to be with every step of the design process. For that reason, we do not offer online ordering. I LOVE YOUR WORK, BUT I LIVE FAR AWAY. CAN WE STILL WORK TOGETHER? Absolutely! Distance is not a deterrent! We often work with clients whom we never have the pleasure of meeting live and in person. We collaborate with our long-distance couples via phone, email, and Skype and can share samples and swatches via snail mail. Truth be told, that’s often our process even with local couples! HOW MUCH DOES AN INVITATION SUITE COST? Costs for custom work vary depending on a number of factors, including the quantity, print method and paper and material choices. Knowing your budget range helps us to create a realistic list of items for you to order – from simple and subdued to wildly extravagant! Is there a rule of thumb when choosing quantities? We recommend ordering extras to accommodate last minute guest additions and keepsakes. Ordering an additional small quantity is much less expensive than re-ordering later. Also, remember, your quantity should reflect the number addresses of you will be mailing to – the families and couples attending your event – not the number of actual people attending. Lastly, keep in mind that calligraphers (or you) will need additional envelopes (10-15%) for possible mistakes when addressing invitations. When should I mail my stationery? Save the date announcements should be mailed 6-8 months prior to your wedding. If you are hosting a destination wedding or plan to schedule your wedding over a holiday weekend, we recommend that you send your Save the Dates 8-12 months prior to your wedding. Your wedding invitations should be mailed 6-8 weeks prior to your wedding. If your wedding is a destination or on a holiday weekend, we advise mailing them at least 10 weeks in advance. How much will the postage cost to mail my invitation? Postage depends on the size and shape of your envelope, weight of the pieces being mailed and where they are being mailed to. We can provide an estimate for postage based on these factors, but we strongly recommend that you visit your local post office for an in-person estimate. Square envelopes, super rigid invitations and invitations with any bumps caused by knotted ribbon or wax seals will incur additional postage costs. We charge 6.35% sales tax only on orders shipped to a Connecticut address. Orders shipped outside of Connecticut are not charged sales tax. Will I see a proof of my design before the invitation is printed? Yes. A full color PDF will be emailed to you for proofreading the wording and reviewing the design before anything is sent to the printer. What print methods do you offer? Whatever your heart desires! The majority of the clients that we work with incorporate letterpress printing into their suites. Each print method offers a different result. With that said, clients are welcome to mix printing processes to create the perfect look for their celebration! To learn the difference between letterpress, engraving, flat/digital printing and foil stamping, read on – the possibilities are endless! Letterpress uses a raised polymer plate for each color used in the design to produce a matte ink debossed texture that’s noticeably pressed into the paper. The raised polymer plate is mounted into a printing press, is inked and then pressed onto paper. The pressure of the transfer leaves a deep impression of the design in the paper stock. Each piece of paper is fed individually through the printing press for each color being printed. This is why letterpress printing is priced on a per color basis. Letterpress printing can be combined with digital printing or foil stamping to achieve a unique look. Like letterpress, the process of engraving presses ink onto paper to create artwork with a unique look and feel not possible with traditional flat printing. Unlike letterpress, however, the design is raised on the paper. This is achieved using a metal plate etched with a recessed design. Metal plates are then hand-aligned on the press. Once aligned, the plate is coated with ink and then blotted using Kraft paper to clean the plate, leaving ink only in the recessed design. The paper is then hand-fed and each sheet is pressed with two tons of pressure, creating an embossed image. Similar to letterpress, each piece of paper is fed individually through the printing press for each color being printed. This is why engraving is priced on a per color basis. Engraving is ideal for designs with fine lines and printing on dark and/or thick paper stocks. Digital printing is a method of printing images and text directly from a computer onto paper. Digital printing transfers four colors of ink (cyan, magenta, yellow and black) to paper simultaneously, producing a full-color print after only one pass through the printer. Unlike letterpress and engraving, the ink lays flat on the paper surface with no impression on the stock. Digital printing is ideal for full color designs and raster artwork (think watercolor illustrations and photographs). For a unique look, digital printing can be combined with letterpress or foil stamping. Foil stamping is somewhat similar to letterpress and engraving, in that the design is applied to paper with pressure. As the name implies, foil stamping does not use ink, and typically results in designs that are shiny and light-reflective. Foil can also be used to add matte colors, like white, to darker, colored papers. Metal plates of the design are created and then mounted into the printing press. The dies are heated and stamped with enough pressure to seal a thin layer of foil to the paper. Similar to letterpress and engraving, each piece of paper is fed individually through the printing press for each foil color being stamped. This is why foil stamping is priced on a per color basis. Foil is available in a wide assortment of colors, finishes and optical effects and can be combined with other print methods like letterpress and flat printing. Laser cutting uses a small, high-powered beam of light to cut paper into delicate and intricate patterns. Laser-cutting technology can also be used to cut and etch materials like wood, metal and acrylic. Will you assemble and mail my invitations? We can for an additional fee. Please inquire for a quote. Yes! Note that certain types of paper are required and additional fees for specialty printing are applied. Can you print in gold on the digital press? Absolutely! Digital calligraphy and hand written calligraphy options are available. Digital calligraphy is when a font is printed onto an envelope by a computer and is a service we can provide. Hand calligraphy is when a trained calligrapher addresses your envelopes by hand using pen and ink. We work with a number of talented calligraphers that offer a range of styles and are happy to recommend several that would be a great fit for you. You are welcome to coordinate the process with your chosen calligrapher directly, or, for a flat coordination fee, Coral Pheasant can take care of all the details for you! If you decide to cancel your order before final proof approval, you forfeit your 50% initial deposit. If you cancel your order after your final proof is approved, we retain the right to keep the full amount paid. If any errors are discovered after your approval of the final proof and we have gone to print, it will be necessary to charge you for a reprint (if requested).